Welcome! We would like to introduce ourselves to you. There are three of us bringing forward the Ancient Future Today. Megan Wagner, Diane Wilcoxson and The Grand Council (TGC). We have been friends and colleagues for many years, working with practical and transformative projects worldwide. Because of the benefits of the Mastery work we have done, we decided to bring this work forward to individuals and groups intending to express their Mastery fully in the world. Together with a Council of energies called The Grand Council (TGC), we both work directly with them in different ways as well as together. Diane: I give voice to The Grand Council’s wisdoms and energies while holding a field of 1200 resonance points. The integrity and relevance of the information is delivered in straightforward, always loving ways. 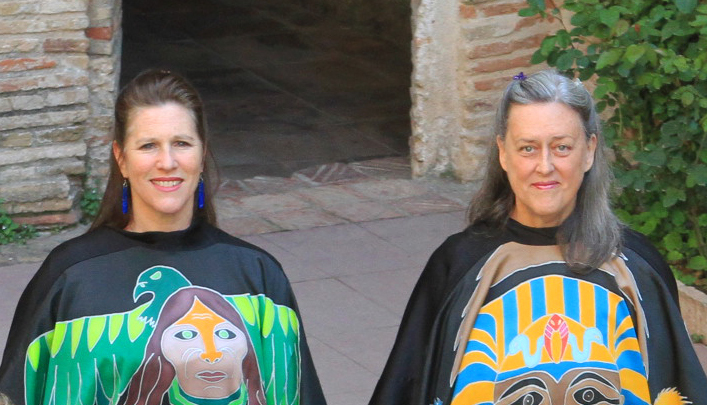 Megan: I work with inspirations stepped into the world through ritual, traditions and artwork that I bring forward currently in the form of my Sacred Robes. The Grand Council: We are a combined Council of energies and resonance bands representative of most of the world’s Grand traditions. Over the ages, these have included mythologies and other forms of stories that have been passed down from generation to generation. Amongst The Grand Council ‘members’, are such energies known as Poseidon, Quan Yin, Jesus, Buddha, Mohammed and most other characters you may think of when you think of wild, epic, and very large stories of gods, goddesses, spirits, and other sources of inspiration and challenge to humanity. Wisdom that is brought through from these realms and from these beings is available to all who participate in Ancient Future Today.